Top Rated Dog Car Seat & Booster Reviews – Let Your Pet Enjoy the Ride in Comfort! In the event of a crash at 50 mph, a 10-pound, unrestrained dog generates 500 pounds of projectile force. In a 30-mph crash, an 80-pound dog would become a 2,400-pound flying projectile! Small and medium sized dogs require an extra layer of protection against hazards in the car. These doggie auto seats help to keep our smallest dogs safe. For bigger dogs, car harnesses and seat belt restraints are the best option to keep them comfortable and safe when commuting. They won’t take up any extra room and work just as well as a seat. Helps to protect the upholstery from your dog’s toenails, dirty paws, teeth, urine and car sickness. It can also keep your dog safely on your seats. There are several models of these products on the market, including different types of harnesses for car belts, dog car seats, and even puppy seats. Each one is designed specifically for dogs of specific weight ranges and sizes, so be sure to pay attention to that. Picking a doggie auto seat can be difficult, which is why we have broken it down into individual reviews so that you can choose which models will work best for your pet. Since your pet is such a valuable member of your family, you should take the time to choose a dog car seat just like you would any other type of car seat. Size: Make sure that the size is big enough for your dog, for both length and weight. Focus more on the weight unless you take longer trips, because weight is a more important safety factor. Ease of Use: How often will you be moving the seat around? Check to see how hard it is to uninstall and reinstall, how easily it stores, and if the covers/accessories are easy to remove and replace. Cleaning: Depending on use, your seat may have to be cleaned often. If your dog often gets dirty on your excursions, ideally you want a model with removable covers that are machine washable and easy to put back on. Your Car: Some cars don’t have headrests, but some seats require headrests to install the car seat. Sometimes back seats don’t have shoulder belts, but you may need those for some booster seats. Make sure that the model you purchase works with your car. Materials & padding: Some fabrics could irritate sensitive skin. Some seats have less padding than others and may not feel comfortable for older dogs. You may need to add hypoallergenic materials or thicker padding depending on your dog’s needs. Use: What will you use your doggie car seat for? You might order a cheaper model for shorter trips and one that is a little more luxurious for long road trips. Breed: Dogs come in all shapes and sizes. Longer dogs such as dachshunds may need a longer seat with more room to stretch out. Bulkier dogs like pugs may need more width. Pay attention to dimensions and always measure your dog before you buy a seat. We have tested the Best Booster Seats for Dogs and collected consumer reviews for your use. The Snoozer Lookout I is a highly-rated dog car seat that will allow your pet to look out the car window as you drive. 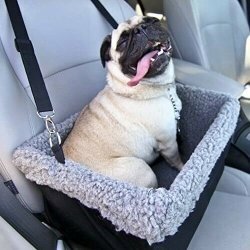 This dog car seat comes in two sizes: small for dogs (or other pets) up to 18 pounds and medium for dogs up to 25 pounds. The faux wool lining keeps your pet warm in winter, but is breathable enough for summer travel. Several pet owners have reported this seat has alleviated their pet's carsickness. The faux wool lining and foam frame make this a super comfortable sleeping spot for both home and car. The cover is removable and is machine washable/dryable. It comes in 8 color/pattern varieties on the exterior, each with an off-white faux wool lining. If you have a dog under 20 pounds that is long and tall, the small size may be too cramped, so the medium may be the better choice. The material is not waterproof, so any spills will leak through. Some people weren't able to keep the seat from moving around with the seat belt attached, and others felt the safety tether was too loose and allowed their pet to jump out. The food/water rack advertised in the product description is not included and must be bought separately. The Snoozer Lookout I is a very comfortable seat for smaller dogs which allows them to look out the window. It’s a good option to try if your pet gets carsick. Long, tall dogs will be more comfortable in the medium seat. So long as you can secure the seat enough with the seatbelt and keep your dog from jumping out, this can work for you. The Snoozer Lookout II is a pricier model than the Lookout I. It comes in small, medium and large sizes. The large is for pets up to 35 pounds or can hold 2 smaller pets. A slide-in plastic drawer is built into the front that could hold a small amount of food, treats or toys. The Snoozer Luxury High Back Console car seat comes in large (for pets up to 12 pounds) and x-large (for pets up to 20 pounds). It’s designed to sit on larger consoles, has a non-skid bottom and a removable, washable microsuede cover. The high-back helps to prevent the dog from jumping out. Built for pets up to 35 pounds, the Snoozer Lookout II is a fantastic dog car seat with some extras that the Lookout I doesn't have. 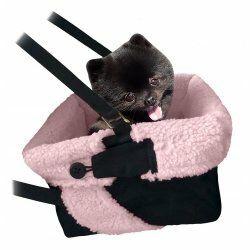 This dog car seat comes in three sizes: small for dogs (or other pets) up to 18 pounds, medium for pets up to 25 pounds and large for pets up to 35 pounds. The faux wool lining is warm in winter, but breathable enough for hot summer days. Unlike the Lookout I, the Lookout II has a built-in sliding storage drawer in the bottom front side of the seat. It's big enough to store toys, treats, and covered containers of extra food and water. The cover is machine washable and comes in several different colors. Some customers didn't like that the cover isn't waterproof. Any spills will soak into the foam frame, likely leading to mold and bad odors. The medium and large sizes may be too big for front seats of small cars. Some people couldn't keep the seat from moving around with the seat belt attached, and others felt the safety tether was too loose to secure their pet. The Snoozer Lookout II is a very comfortable car seat for dogs (or any pet) 35 pounds and under and helps them to see out the car window. It may also help carsick pets with motion sickness. 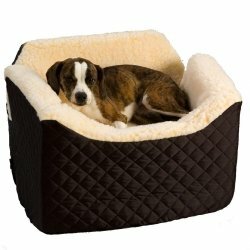 Many customers say their pooches loved this as a pet bed as well as a car seat. So long as you are able to firmly secure the Lookout II with the seat belt and keep your pet latched in and unable to jump out, this pet seat should be a very safe option. The Snoozer Lookout I is available in both small and medium sizes and in 8 different colors. It does not come with a built-in storage drawer, but is quite a bit cheaper than the Lookout II. There's also a Luxury Lookout model that is quite expensive with a removable microsuede cover. Like the Lookout II, it has a storage drawer. It comes in small or medium sizes, 12 fashionable colors and has a removable pillow with a washable cover. The K&H Bucket Booster seat is a super comfy seat that boosts your little dog up so she can see outside the window. It’s rounded shape better fits the shape of vehicle seats. It comes in two colors (gray or tan) and two sizes. 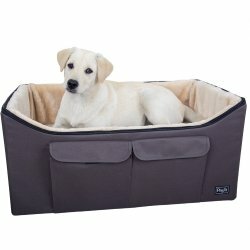 There are no weight limits listed for this product, so knowing your dog’s size is important for this one. However, the small size is recommended for one small dog. The large can hold two small dogs or one medium sized dog. Quilted fleece lining & 3 inches of padding make this seat nice and soft. Two security leashes are included that adjust from 10 - 18 inches so it’s easy to secure two small pets. The seat is secured with the seatbelt threaded through 3 loops under the removable cushion. The cover is removable and washable. It’s a rather bulky seat so it may be too large for your vehicle seats if you have a smaller car or a car with bucket seats. Threading the seatbelt through the loops to install can be tricky, especially in a smaller car. The cloth is not waterproof, so urine and other liquid stains can seep through and soak into the foam. At least one customer reported that the seat performed well during a crash in which the car was totaled. Another customer, however, said the tether broke when they had to brake suddenly. The tether is attached to the fabric of the seat, which isn’t as sturdy as it could be. For extra protection, we recommend a separate seat belt restraint to use with your dog’s harness while riding in this seat. The K&H Pet Products Mod Safety Pet Seat is a slightly cheaper model that is more compact. It comes in one size and is 15”x15”x15”. The whole seat zips together and unzips for easy folding up and compact storage. Not much padding but a great option for trips where you’ll be using a rental car, etc. The K&H Pet Products Hangin’ Bucket Booster is about $30 cheaper than the others and holds pets up to 15 pounds. It secures to the seat by straps that hang around the headrest and the back of the seat. It will work in most front seats but won’t strap to back seats that are not able to fold down. 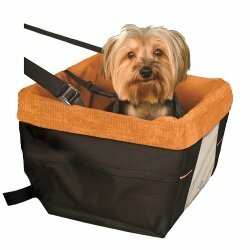 This booster seat comes in “front” (small) for dogs up to 15 pounds and “back” (medium) for dogs up to 45 pounds and has two storage pockets. The liner is removable and machine washable. It’s also reversible - smooth side for warm days, plush side for cold days. It comes in 2 colors - dark brown or gray/blue. The booster seat straps to your vehicle seat to keep it in place. There’s also a storage bag to make storing and carrying easier. Pet parents loved that their dogs could lie down or sit up to enjoy looking out the window. Several people reported that their once-carsick pet was no longer sick while riding in this seat. Other pet parents said there were no written instructions, just bad pictures, and the information was also not on the manufacturer's website. Some dogs didn't like the feel, and the seat didn't attach well onto some vehicle seats, such as a 60/40 seat. Customers loved how easy it is to clean and that their pets enjoyed it as a bed in the house as well as the car. The biggest complaint was about the attached leash. Some people reported that it was very thin like ribbon and broke easily when their dogs pulled on it. 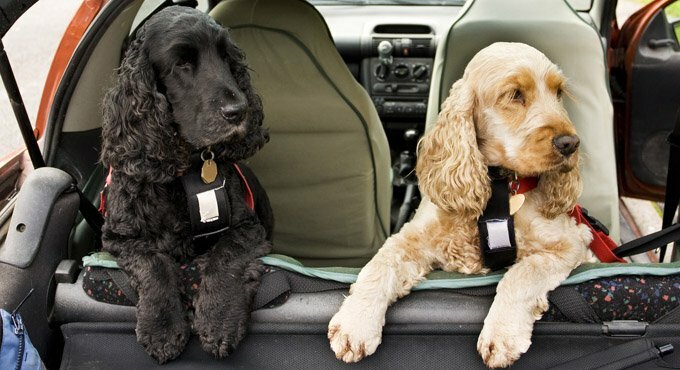 You may want to also secure your pet with a seat belt harness for backup, especially if they tend to jump out. The smaller Petsfit Lookout Car Seat for the front seat is about $30 cheaper than back seat size. The storage pockets are on the sides instead of on the front like in the larger one. This cute little booster seat is good for pets up to 20 - 25 pounds, depending on the size of your dog. It has a metal frame with a thick fleece lining and in one color combo - black with a pink lining. It straps over the seat back so it’s elevated and not touching the bottom of the vehicle seat. This seat comes with a collapsible silicone dish and soft blanket for added comfort when traveling. It can be used in either the front or back seat (including 60/40 rear split fold down seats). The exterior is water resistant and the liner is machine washable. It comes with an adjustable safety leash to hook onto your dog’s harness. Since it hangs from the vehicle seat back, you’ll most likely have to pick up your pet to get him in and out. Depending on your car’s design, the straps may not fit well around the headrest/seat. If they are loose, your dog may tip the seat over and fall out. Most customers found this seat easy to install and said it felt sturdy. Some reported an improvement in carsick pets. There were mixed opinions about the tether. Some felt it was too long so their dogs jumped out. Others felt it was too short. Same goes for the straps that attach to the vehicle seat. The straps may be too long or too short on different seat styles. The Devoted Doggy Deluxe is another hanging style of seat that allows your pooch to enjoy the view. It comes in one size and two color choices (black/grey and blue/beige). It’s designed for dogs up to 15 pounds and has a hard bottom for sturdiness. The exterior is a sturdy canvas fabric while the interior is a thick fleece. The collapsible metal frame makes this seat easy to fold up and store. The plush inner lining is removable and machine washable. There’s a zippered pocket on the side to hold treats, toys, etc. Installation is easy, with one strap that hooks around the headrest and another that fits around the seat back. The company offers a 100% lifetime warranty. 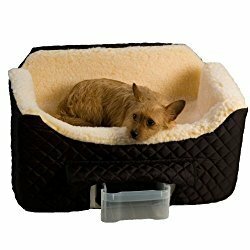 Like similar models, this one doesn’t fit flush to the bottom of the seat, so you may have to pick up your pooch to put them in it, especially if they’re older or have other health conditions. While the manufacturer claims the seat will hold most dogs up to 20 pounds, several customers said their dogs were too cramped in the seat, even though they weighed less than 20 pounds. Some owners liked that their dog’s hair didn’t wind up all over the car. One owner cautioned that the nylon straps that hook around the car seat could scratch leather upholstery. He suggested felt seat belt shoulder pads to wrap around the straps where they make contact with the leather. Know that if your dog is toward the high end of the weight range, he may not be able to lie down comfortably in this seat, depending on his size. The exterior fabric is waterproof to avoid accidents getting on your vehicle seat. The interior lining and pad are removable and machine washable. Two zippered pockets are large enough to hold a leash, water bottle, treats and small toys, etc. The company also has a lifetime warranty on all their products. The tether that attaches to the dog’s harness can become too tight if the dog twists and turns a lot. Though recommended for dogs up to 20 pounds, your dog may be cramped while riding if they are a longer breed. You must have a headrest to attach this seat, so it may not work in your backseat. Most customers said their pets loved this seat. Some said they felt more secure knowing it had the seat belt tether to attach to the harness. Others said it helped a lot with car sickness. Some thought the sides were too high so their pooches couldn’t rest their head on the side while lying down. Others said the tether was too long, so their pooch could jump out. Some had issues keeping the booster at a flat angle. The Kurgo Rover Booster has a 1-layer interior as opposed to the 2 layers in the Skybox. The storage pockets have a hook & loop closure instead of zippers. 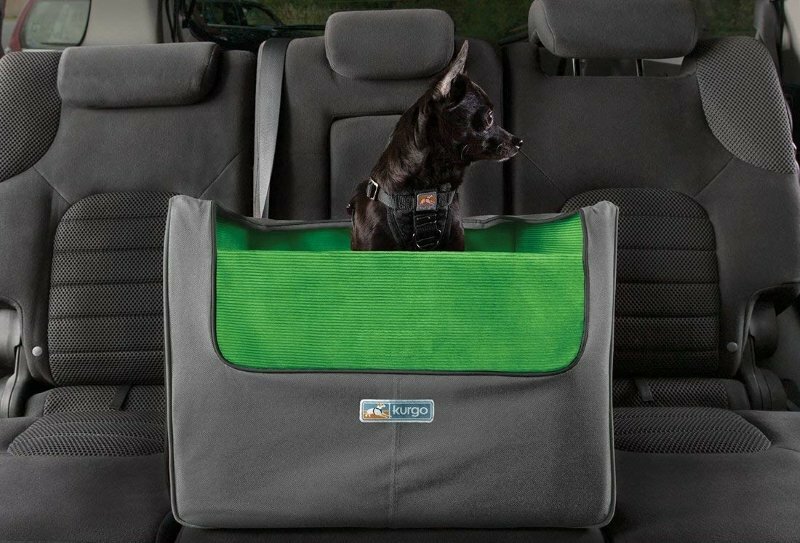 The Kurgo Skybox Rear Booster Seat is designed to fit directly on the rear seat of your car. It has zippered pockets and doubles as a travel bed. It’s about the same size as the original but costs about $40 more. The Kurgo Heather Booster has a smooth fleece lining and pockets with hook & loop closure. The Kurgo Journey Booster is a sporty style with zippered pockets and a removable, washable pad. The liner is not removable. The Kurgo Nantucket Booster has a nautical look and storage pockets with a hook & loop closure. The Solvit Jumbo Deluxe’s Safe-T-Core frame secures the booster with your seat belt. It has a safety tether that also attaches your dog’s harness to the seat belt. It has a quilted faux suede shell. The quilted plaid liner is removable and washable. It quickly installs in either the front or back seats. 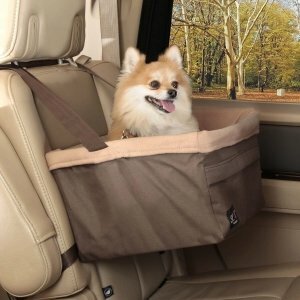 It’s designed to hold dogs up to 30 pounds and sits flush on the car seat, elevating the pet 9 inches so they can see out the window. It comes in only one size and color (beige/tan plaid). The seat belt installation makes it easy to install this in either the front or back seat. It’s roomy and padded well for naps while traveling. The safety tether has been crash tested to 2,000 pounds. The seat is rather wide and may not fit well in some seats, especially bucket seats. The safety tether could be too short to comfortably attach to some harnesses, depending on the harness style. Assembly can be a challenge with all the plastic panels you must put together for the frame. Most customers said their pets enjoyed this seat. At least one customer reported that her 9 month old pug was fine after their car was hit while going through an intersection. 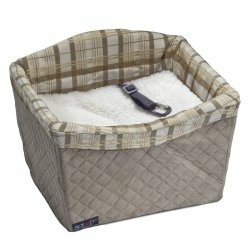 A few customers stated their dogs loved this as a bed at home as well as on the road. Several customers had trouble assembling the frame, saying the pieces did not align properly and were missing connection points, etc. so there may be some quality control issues there. Others said it didn’t have enough padding. The PetSafe Jumbo Standard seat is the same size, installs the same, and also holds up to 30 pounds. The only difference is the fabric is a polyester shell with a faux sheepskin liner. The PetSafe Deluxe Tagalong seat is a hanging style seat that comes in large (up to 18 pounds) or x-large (up to 25 pounds) sizes and has a quilted micro-suede shell with quilted plaid liner. The PetSafe Standard Tagalong seat is also a hanging seat that comes in medium (up to to 10 pounds), large (up to 18 pounds) or x-large (up to 25 pounds) sizes and has a polyester shell with faux sheepskin liner. This premium priced seat is probably the most fashionable on our list. It’s also the only rear-facing seat on our list. It looks rather like a big catcher’s mitt and secures like a child car seat to the seat belt and LATCH systems in your car. According to the manufacturer, the seat has been crash tested at an NHTSA-approved lab and exceeded standards for infant car seats. 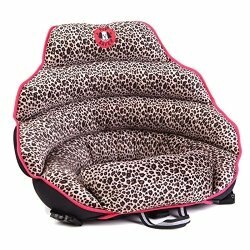 It comes in one size, 2 color combos (black/white houndstooth & red/black with leopard print) and is designed for pets up to 30 pounds. Five seatbelt-grade plastic clips lock this seat into place and work with the seat belt pretensioner to pull PupSaver over your dog in the case of an accident. Heavy duty J-hooks attach to the LATCH anchors for extra protection in the back seat. Sides have inflated portions that work like airbags. The patterned fabric helps hide hair/dirt. The lining is not removable or machine washable. It can be spot cleaned. Installing at all 5 points can be challenging for some. Dogs less than 30 pounds can feel cramped depending on size. Customers for the most part felt that it was secure when installed properly, though many would prefer metal clips instead of plastic. It helped some dogs with car sickness. By far the biggest complaint was about the difficulty of installation and how the back of the seat kept folding over the dog. We recommend watching tutorials on YouTube and the PupSaver website so you get it installed correctly. Dogs and humans were traveling together long before cars were invented. Humans have been providing special transport for their dogs for centuries.In fact, there were even dog car seats in buggies and trains. However, 1932 saw the first dog car seat with the invention of the Bird-Dog’s Palace, a crate style device that held pets of all sizes. This was slightly better than the version from 1936, when a sack came on the market that held the dog. It was comfortable, but did nothing to protect them in an accident. In 1957 Marie French created a pet trailer which hooked on the back of the car and had food and water bowls. It was comfortable for the dog and allowed them to roam freely. Today’s seats have come a long way and have once again allowed the dog to ride inside the car with his or her owners. Dog booster seats and other car pet restraints, unlike child safety seats, do not have standard, federal safety tests that they must pass in order to be legally sold. Any crash testing claims and scores are from independent tests either from manufacturers or from organizations such as the Center for Pet Safety. Those tests can have varied results due to the different testing methods and conclusions. Therefore, it’s up to you to decide which products you feel would be safest for your dog. Keep in mind, however, that any car restraint is better than none at all. 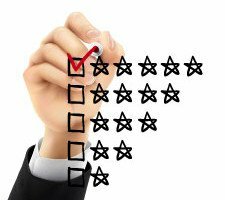 We list our own observations and recommendations based on research and customer experiences. From that, we’ve gleaned some good safety tips that you should follow. Never attach a car seat tether to a dog’s leash. It can choke them or cause severe neck injury in a crash. Attach it to a safety harness only. Always secure your dog to the seat tether or preferably the vehicle seat belt while riding in a booster seat. They can easily fly out of the seat in a crash or run around in the car or jump out of an open window if they’re not secured. Never leave your dog alone in the car, even with windows cracked. Car interiors can heat up over 40 degrees in just under an hour. Just like with children,dogs can easily become overheated with sometimes deadly consequences. Keep your eyes on the road, not your dog. If your dog is nervous and tries to jump out of his booster seat, this can be a real distraction. Introduce a new booster seat slowly by letting the dog sit in it at home, then in a parked car, then very short trips, until he’s able to sit quietly and enjoy the ride. Avoid mold and bacteria growing in foam framed booster seats by placing a waterproof diaper changing pad between the cover and foam frame. If your pet has an accident, it will keep the liquid from soaking into the foam while you wash and replace the cover. Just as with child safety seats, it’s best to put your dog in the back seat of your car because the air bags can do serious harm if you are in an accident. The best place is in the back passenger’s side of the car because you can check on your pup in the mirror, and he will be able to see you and know he is safe. If you have a middle rear seat that you can attach the seat to (which is rare because in many seats you need a headrest), this is actually the best place for your dog. In cars that have three rows, keep your dog in the row closest to you. If you do put your dog in the front of your car, make sure to put the seat back as far as possible so that your pet won’t be hit by the air bags if they do go off. If your car has the option, turn OFF the passenger airbag while with your dog. Dog safety seats aren’t exclusive to dogs. Any pet of equivalent size can ride in them. Owners often use these products for cats, rabbits, baby pot-bellied pigs or any other pets that fit within the size and weight range. So long as your pet is a good traveler and restrained well, you can enjoy a trip with a cat or rabbit just as much as a trip with a dog. The best car seats for dogs help to keep your dog in place while you are traveling and keeps him or her safe so that you can get from one place to another. According to the National Highway Traffic Safety Administration (NHTSA), nearly 10​% of all​ fatal crashes and 18​% of injury crashes involve some type of distraction. Even worse, nearly 25​% of pet owners have used their hands or arms to hold the pet in place while applying​ brakes and 19​% have used their hands or arms to keep their pet from climbing into the front​ seat. These behaviors may require both hands being taken off the wheel which can allow your car to drift into other lanes or run off the road. Booster seats for pets keep that distraction to a minimum. The rate of motor vehicle collisions for older drivers who always drive with their pet was nearly double​ that of drivers who never drove with their pet.​ They are also among the least likely to use a pet restraint system. In a recent survey of drivers, interaction with pets was one of the top three​ most frequently​ reported distracting behaviors that resulted in an accident or near-miss. Dogs may start barking at something that you cannot see, want to climb in your lap, try to jump out the window or an open door, or divert your attention in many other ways. Keeping them secured in a pet restraint will prevent many of these distractions. To transport big dogs, using travel crates will keep them in place so they’re not a distraction. In an accident, it will keep them from panicking and fleeing the scene. Crated dogs have been shown to have a higher likelihood of surviving a high-speed crash, but they can still bang into the crate and be injured. Dog harnesses are another good option for dogs of all sizes. They attach to your vehicle seat belt but small dogs won’t be able to see out the window very well which could increase anxiety and carsickness. You’ll also want to put a seat protector beneath them to prevent scratches and shedding on your upholstery. Smaller dogs (up to 40 pounds) prefer a doggie booster seat or a small pet carrier (soft or rigid). Most models allow your dog to comfortably sit or lie down. The booster has the advantage of allowing them to see out the window and can decrease carsickness. Hello: I’m looking for a high back n Safe one for my pet rabbit. We are going on a 11 hour road trip. He loves driving. I currently have a carseat thats in your suggestion list. But want a more safer n comfy one. The one I have is beige n plaid. If your rabbit doesn’t like a carrier like that and can sit still while you’re driving, you could try the Snoozer Lookout 1 in small that fits dogs, cats and other small pets up to 15 pounds or the Petsfit Booster in small that fits pets up to 15 pounds. I’d rather use these in my back seat rather than the front seat as pictured. Is that possible? It depends on how both your dog seat and backseat are designed. Some dog seats like the A4Pet Lookout can work well in the front or back. Others, such as the PetsFit may not work as well unless you have movable headrests in the backseat to which you can attach the strap. 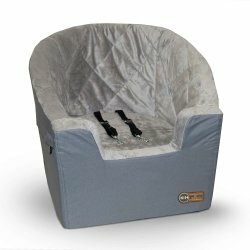 I’m looking for a car seat that works well in a convertible. I have a converible Karmman Ghia and I want something safe for my puppy that will be a mid size dog. I have a cat who’s kind of skittish when traveling – would any of these be a good choice for her? That will depend on your cat. Several cat owners have used ones like the Snoozer Lookout and said their cats loved riding in it. However, some cats still preferred their crates when riding. If your cat is very nervous while riding, the crate is probably the best option.